Welcome to Pai Gow Poker Online! We focus on the popular casino game Pai Gow. We are one of the most comprehensive websites covering the subject Pai Gow and it’s popular searches like Pai Gow Poker and today, Pai Gow Poker online. We are enthusiasts of the game and this site is devoted show you how to play Pai Gow Poker like a pro! We cover all sorts of Pai Gow topics including strategy, tips, advice, history, etiquitte and more including a detailed explanation on how to split two pair, about being the banker, a list of common pai gow mistakes to watch out for and details about playing pai gow poker online. 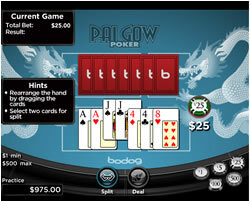 You can also play a Pai Gow Poker game without downloading any software or installing any programs to your computer. We also mention the top online casinos to play pai gow for free or for real money, the choice is yours! Welcome to the site and enjoy the content! Welcome to our Pai Gow Poker site! Pai Gow Poker is based on an older Asian game called Pai Gow. The original game was invented centuries ago and used tiles (they looked like dominos). In order to make the rules easier to understand for a Western audience, the tiles were abandoned for playing cards. Today, Pai Gow Poker is played with one standard deck of playing cards combined with a single joker, and the game is one of the most popular at the online casinos. Hands are ranked according to conventional poker hands, which makes determining the winner intuitive for most U.S. gamblers. On this site, we’ll provide a detailed overview of the rules, Pai Gow Poker strategy that will maximize your chances of winning while reducing the house edge as much as possible, and a whole lot more. Most novices who observe the game without knowing the rules become confused. However, you’ll discover that Pai Gow Poker is not only relatively simple, but fun to play. In land-based casinos, Pai Gow Poker is played between the dealer and up to six players. When you play the game at online casinos, you are the only player. Each hand begins after you choose the amount of your bet (according to the table limits). Seven cards are dealt to you face up and seven cards are dealt to the dealer face down. We have a more comprehensive guide on how to play Pai Gow if you want to go through the finer details. To play, you must choose two of your seven cards and place them in a separate 2 card hand. The dealer does the same with his 7 cards. At this point, your hands are turned face up and compared against the dealers. You compare your five cards to the dealer’s 5-card hand and the the two cards you isolated will be compared to the dealer’s 2-card hand. Your bet is riding on the outcome of both hands. The goal in Pai Gow is to win both hands. You can learn your chances of getting different hands by looking through the odds of Pai Gow and of course reading our tips and strategy articles. If the dealer’s 5-card hand and 2-card hand beat your hands (respectively), you’ll lose your bet. If both of your hands individually outrank the dealer’s hands, your bet is paid out even money (i.e. 1:1), less a 5% commission. If one of your hands outranks the dealer’s corresponding hand (for example, your 5-card hand beats the dealer’s 5-card hand), but your other hand loses, your bet is pushed back to you. If one of your hands wins, but the other hand ties the dealer’s hand, you’ll lose your bet. If it sounds confusing, it isn’t really. Read our pai gow tips for advice on how to play your hands to maximize your odds of winning and how to split up your hands. First, your 2-card hand cannot outrank your 5-card hand. If you’re playing the game at an online casino, the software will prevent you from proceeding until you fix the problem. If you’re at a land-based casino, you’ll typically lose your bet based on your committing a “foul.” Be wary. Second, you’ll recall that the game is played with a single joker. The joker can be used to make straights or flushes (and of course, straight flushes). Otherwise, it represents an Ace. Optimal strategy for playing Pai Gow Poker is complex for two reasons. First, some land-based casinos allow you to assume the role of “banker.” However, not only is this becoming less popular in the largest casinos, but few top-tier online casinos allow it. So, we’ll ignore the “banker” component when discussing playing Pai Gow poker online. Second, the largest influence on reducing the house edge is the manner in which you split your cards. And therein, lies the complexity. Because there are so many possible hand combinations, you would need an enormous pai gow hand chart to play the “house way.” Even if you had the chart in front of you while playing, the game would proceed at a snail’s pace. To keep things relatively simple, we’ll provide a few rules of thumb. If you adhere to them, you’ll come very close to achieving the minimal 2.66% house edge on Pai Gow Poker. If you’re holding one pair, keep it within your 5-card hand and isolate your two next highest cards. If you’re holding two pairs, keep the highest ranking pair in your 5-card hand and isolate the other one. If you’re holding three pairs, isolate the highest ranking one. Don’t split a three of a kind. If you’re holding a full house, isolate the pair. Don’t split straights and flushes unless you’re holding two pairs. With a four of a kind, look at the card ranking. If you’re holding twos through fives, don’t split them. If you’re holding sixes through nines, split them unless you have a King or an Ace. If you have a King or Ace, keep the four of a kind intact. If your four of a kind is made up from tens or face cards, split them unless you have an Ace. If you can remember the above rules, you’ll shave the house edge on Pai Gow Poker as closely to 2.66% as possible. You can also take a look through the odds playing pai gow or even test them out yourself playing a pai gow poker game. We recommend that you visit Bovada Casino to play Pai Gow Poker. They offer fantastic gambling software, but also allow you to play the game directly within your browser. Their customer support is top-notch and available by email or phone 24 hours a day. You’ll also be impressed by their bonus structure. When you join Bodog Casino and make your first deposit, they’ll give you a 10% bonus match instantly up front. While that’s a lower match than many online casinos offer, you’ll receive your bonus within 30 minutes of making your deposit and you don’t have the huge slew of terms and conditions that can instantly void your bonus at many casinos. Plus, they let you meet the 15x wagering requirement with most of their games and they constantly offer the best odds of any online casino. Take a moment to visit Bovada Casino and play Pai Gow Poker. You’ll understand why they are one of the most popular gambling sites online.